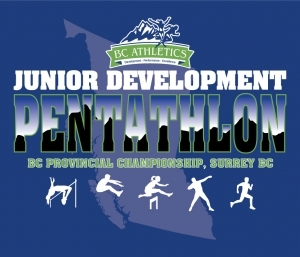 Thunderbird athletes performed amazingly at the BC JD Championships on June 23 in Surrey, BC. Most notable were a 1,2 placing by Maclean Carson and Luc Primeau in the 11 year old boys division and a bronze medal from Nyla Tukker in the 12 Girls competition (setting a PB in each of the 5 events) and Elijah Clarke in the Boys 10 event with a huge PB in high jump. Alice Barton 8th, Lilli Horlock 12th in the Girls 9 year old event. A 6th place came from from Jessica Mills, 7th from Faryn Murray-Rutley, and 12th from Natalie Franke in the Girls 10 year old event. Chloe Symon finished 5th, Gabbie Barton (8th) and Kate Logan (12th) in the 11 year old girls, while Sonia Drobe finished 15th in the 12 year old girls event. Clare Logan finished 4th in the Girls 13 event, very close to a medal spot, with Emily Franke in 8th and Jordan Reed 11th. Griffin Cole finished 7th behind Maclean and Luc in the Boys 11 year old category, with Lucas Gonzales and Roman Yeterian finishing 11th and 12th. Kai Martland finished 7th in the boys 12 year old event, with Brayden Horlock and Justin Verbanic finishing 8th and 12th in the Boys 13 event. 4 medals and 14 top 8 placings. A truly outstanding performance. Way to go!